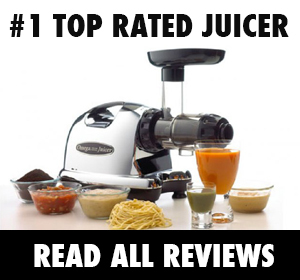 One of the smartest ways to use your juicer is for whipping up juice recipes for digestion. After all, who amongst us hasn’t experienced some sort of digestion-related woes? Whether it’s constipation, digestive upset or just good, old fashioned gas – your juicer can help. 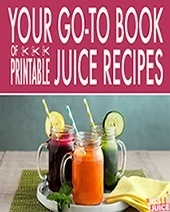 And it’s not just for your garden-variety gut troubles – once you know what to juice for various ailments, you can even start juicing for long-term gut health. For example, to improve the good bacteria in your gut as well as to heal conditions like ulcers. So if your insides are feeling a little raw, cramp-y and under the weather, here’s what you need to know to whip up some fresh gut medicine. Pronto! What to Use in Juice Recipes for Digestion? As you already know, raw and fresh fruits and vegetables are all good for you. Each and every one comes with unique benefits that can’t just be boiled down to vitamins and minerals. But when it comes to gut health, some are better than others. Here’s a little list of the tummy trouble superstars you’ll want to fill your digestive juice recipes with! 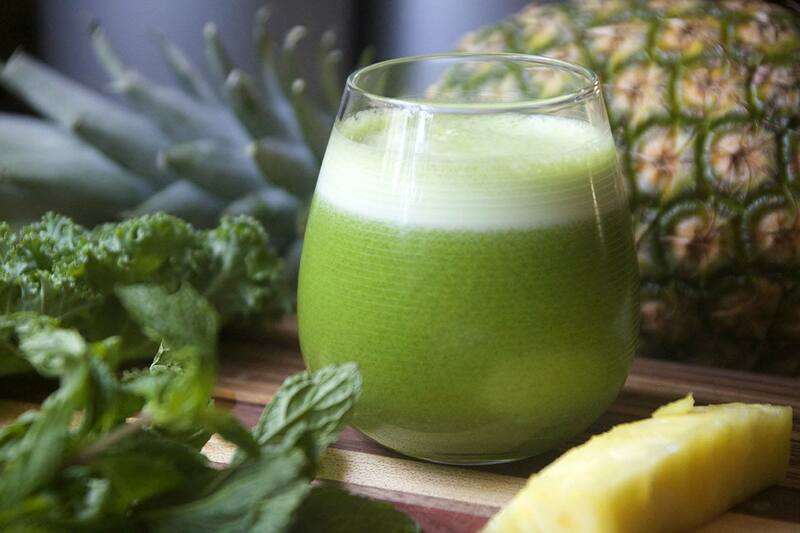 For easier digestion: Juice up pineapple (especially the cores!) as this yummy fruit is very rich in bromelain, a protein-digesting enzyme. Another great fruit is papaya, which contains papain, one of the most effective enzymes for breaking down meats and other proteins. Also worth mentioning is pear, which help stimulate the secretion of digestive juices so that the food can flow easier through the system. Last but not least, mango is not only delicious, but contains amylase, an enzymes that boosts the digestion of carbs and starch. 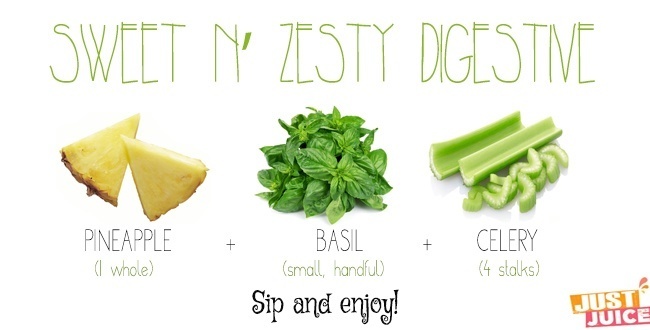 Note: Take advantage of these digestion-aiding juice ingredients before a meal. For nausea and stomach upset: For those times you feel queasy or your stomach is throwing a riot, reach for herbs to juice. Mint tops the list for easing nausea and an upset stomach but please be cautious of it if you have or have had an ulcer since it can also irritate the stomach, especially in larger quantities. 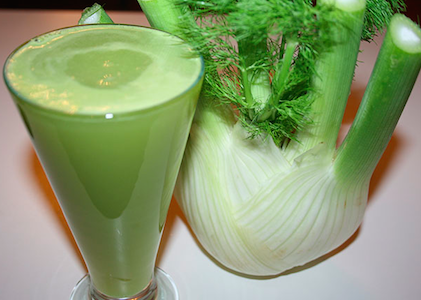 A safer bet is fennel, which boosts digestive function and even acts as a slight diuretic, stimulating your system to flush out excess fluids and toxins. 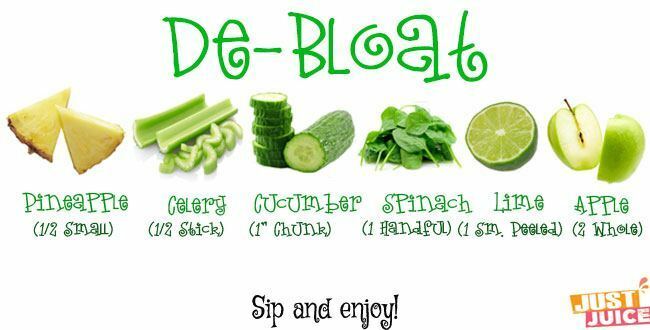 It’s great for digestion, detox, cramps, bloating and even for soothing heartburn. And, of course, we can’t forget ginger, which is abundant in compounds that sooth and relax the small and large intestines and helps get rid of excess intestinal gas that can cause stomach pain. For ulcers and stomach inflammation: For those of us with stomach conditions that cause our insides to feel raw, sore and plain awful, one of the best things to juice is the humble cabbage. Raw cabbage is naturally rich in Vitamin U. This vitamin, commonly referred to as ‘cabbagen’, strengthens your stomach lining and makes it resistant to ulcers. It’s also a great bowel cleanser, detoxifies your colon and helps cure any already-present acute ulcers in your digestive tract. Another awesome tummy superfood is lotus root, which you should be able to find at your local Chinatown. Simply peel, chop and juice it raw – it’s a very soothing root veggies that promotes gastrointestinal motility and speeds up the healing of ulcers. Okay, now that you know the raw ingredients – here are some suggestions for combining them in a way that pleases your tastebuds! If you’re digestion is lagging a bit, this is a simple juice recipe for digestion to get things breaking down and moving along in a deliciously easy manner. Pineapple’s a great source of bromelain, which aids digestion by helping your stomach break down proteins faster and basil has long been used as a digestif to relieve stomach cramping and gas. 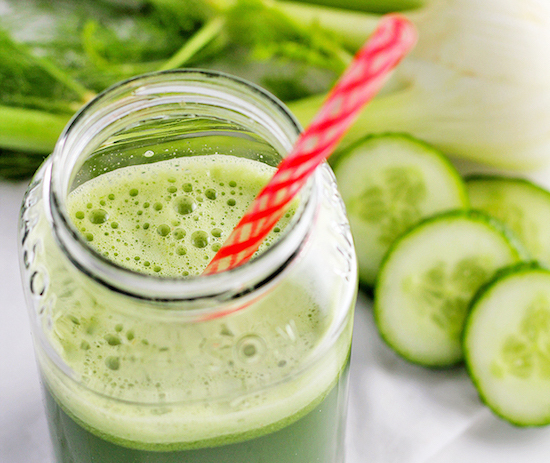 Celery provides a good base for this juice recipe and is a valuable source of insoluble fiber – yet another reason to use your juicer pulp – as well as a gentle diuretic to get things moving. 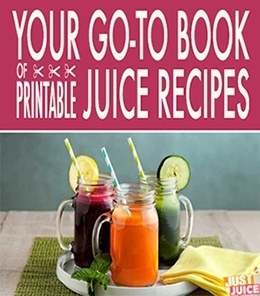 Did I mention this juice recipe is delicious, too? When your having tummy troubles, the last thing you want to do is fuss with a complicated juice recipe. Which is why simple, 2 or 3 ingredient juice recipes are best for times of digestive upset. We love how quick and easy it is – plus, it’s so refreshing and low in sugar so you can sip on it, guilt-free, all day until your tummy perks back up. Of all the herbs out there, burdock root has got to be one of the heavy hitters. This woodsy root is the thing to juice if you’re looking for a thorough, potent detox. It’s a great source of polysaccharides that help support the liver and expel toxins from the blood. But that’s not all it’s good at expelling – burdock’s also known to stimulate the digestive tract by increasing bile and promoting better absorption in the intestines. The result? It keeps you regular. On top of that, pineapple’s chock full of digestion-aiding bromelain, which helps with digestion by breaking down proteins faster. Cukes, of course, provide a smooth and refreshing base and are loaded with essential minerals to help your body replenish. 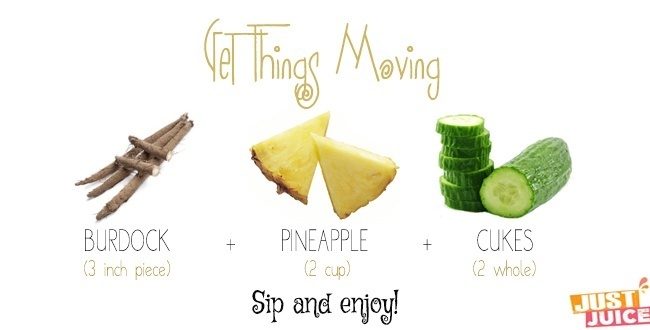 It’s so easy, so refreshing and feels so good for the insides. Quick note: if you have kiwi on hand, replace the apples with the kiwi for an extra digestive boost. Is persistent flatuelence making your vegetable rich diet an annoyance to your family members or coworkers, or is a gassy bloat making you feel puffier than ideal? No reason to make either them or you suffer through that, when a mean green digestive juice recipe like this one can de-flate the problem. This delicious juice will also soothe a stomach troubled by discomforts, like that uncomfortable feeling you get when you’ve eaten too many of the wrong things. This recipe produces a glass of liquid wonderfully light, with just the right amount of gently sour sweetness. Make it for yourself today and feel the puffiness fade away. Very good site. Very informative.